Naka-Shibetsu is the easternmost airstrip in Japan. Passengers descending the ramp attached to the small plane are divided by their appearances in two ; the ones　in　business suits are buyers from giant corporations for the various kinds of sea products from Okhotsk and the ones in their casual clothes are tourists who want to experience the remote and somewhat desolate district. 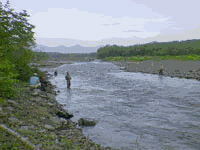 Among them are anglers after salmon, mostly fly-fishermen. Saito is my fishing pal who organized this tour. He seemed to have spent a lot of time arranging things for the trip. He is the type of person who does things with all his might only to end in another mediocre or lower than expected results. Some of his friends like him because of this. While he was struggling with the form at the rent-a-car counter beyond the exit of the baggage claim, I was scanning for my bazooka-like-container filled with fishing rods and hopes towards the conveyer belt. There were several similar cases. Some are of better quality, some had more worn-out stickers and tags than mine, that indicated their fishing histories. Our car finally cruised into the sparse traffic. The straight road cutting across the pristine forest of the silver birch and beech led us to the never ending horizon. By 11:30 a.m. we arrived at the administrative office of the salmon fishery where you can get permission to fish the river called "Riv.Churui"; the first river in Japan to allow non-professional fishermen to fish salmon. There are three more additional rivers open to the public in Japan but Churui still enjoys the most popularity by far among the nature seekers. There were about 20 cars methodically parked at the designated parking lot adjacent to the salmon river. The license plates varied in their origins from Shizuoka to Miyagi.We were only to view the lay of the land before checking in to our lodge but couldn't help starting preparation with the fear of losing our catch; a pair of waders to my waist, a fishing vest , a fishing cap clipped to the fringe of my T-shirt and a pair of polariscopic glasses slung around my neck. Slipping out the two pieces of the rod from the hard case, I lined up the eyes and jammed them together hard enough and attached my favorite reel, like a sniper elaborately assembling his rifle for his next kill. The first drop we stepped in was seemingly a popular stream, occupied by 10 fly-fishermen leaving no room for a late-comer. Almost all were middle-aged gentlemen that looked to be enjoying the nature more than the fishing itself. The fishermen generally are made up of two types; one is trying to get fish by hook or by crook, the other is only out to enjoy finding himself fishing. These fishermen were the latter ones. They still had more or less childish expressions on their faces as they swung their rods to their own rhythms acquired over a long time of fishing. I inevitably feel whenever I meet people with the heart of child that I've come back to where I belong. It might be a main reason why I flew all the way up to the tip of Japan. We slowly waded across to a guy and asked the perfunctory question about how well it was going, while I knew he was sure to reply "So-so". You could tell from his eye movement and the way he controlled his rod and line, he was a seasoned fly fisherman; what it takes to be a good fly fisherman is to have good hand eye coordination. An untrained fisherman can not get a single fish because his mind is more on the rod than on the hook. You have to find a right person to get the basic info on the river before you actually start fishing when the water is very new to you. He kept 3 fish in his own pond, shallow water was surrounded by rocks to keep them alive; one Karafuto-masu (Pink salmon) of 50 cm and two Shiro-zake(Cham salmon or Dog salmon, much bigger kind of salmon than the Pink)he claimed the bigger one at the size of 72 cm. 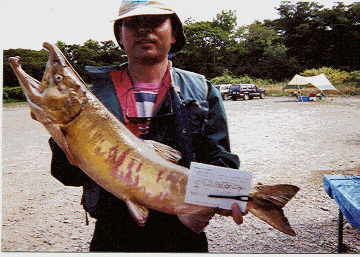 I got to know it later that his Shiro were two of the 15 caught in entire river on that day. We were able to get the detailed information from the river keeper on how many fishermen were in the river, how many were landed on the prior day. 143 fishermen on the day. The shallow stream suited for fly methods. What we had was the lure method for the bigger targets. We refrained from the first cast there because our heavy lures might have caused some troubles with other fly fishermen with their floating fly hooks. We walked upstream along the boulder scattered bank. The farther we went up, the scarce the number of fishermen became. We saw some Pink kept in the pools of their own making by the shore.They might have been planning to hav e them cooked at their accommodations or to freeze them back home. 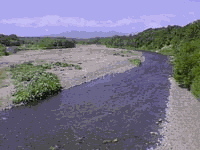 In this river, the release policy is prohibited for the hooked fish, they claim, is doomed to death. (I don't agree with the idea.) The water pools indicated that this kind of fishing was supposed to stay at a desirable point for some time, not only for hooking but also landing, and wait for the salmon to swim up, not to chase. Along our way, we got some glimpses of the emerging dorsal fins out of clear and shimmering water. We chose a wide and smooth stream, deep and wide enough to swim our spoon of 25g with a big single hook. I use 3 to 5g-spoon with a treble-hook for 30cm trout in Honshu rivers. Fishing here is very special. I made a cast right across the stream, gave it an adequate line slack to sink the lure to the river bed and took up the slack as I felt the lure started swimming across the rocked bottom. I knew targets were posing behind the hidden rocks with their spouse resting their fins for the long journey to the far upper stream to spawn. It was about 1 hour since the first cast; I could feel tention on the line which I thought was another snag. I make it rule to give it a jerk just in case, whenever I feel anything at the end of the line. It was just a right pull. The line suddenly ran upstream so first that the air cut into the water along the taut line, reel making a squeaking noise. My right hand held the rod grip very hard, pulling back with my right elbow pushing the grip end forward, my left hand quickly moving between the reel handle and drag adjuster to keep a suitable tension on the line. The power exchange lasted about what I thought to be around 10 minutes, Saito said it was 3 minutes. I finally drove it over to the shallow to weaken its power. You can not use the landing net by yourself in this case. When you get closer to it with your net, it will be startled and dart away with its all-remaining power that will cuts the taut line because of its short length. That was about 4:00 p.m. Before 5:00, we had to get back to the river keeper in the hut built on a corner of the parking lot to submit the report cards filling in the numbers and the kinds of fish we got. We reported only one male Pink salmon on that day. Pinning our hopes on the following day, we left for our inn. I was dead beat when arrived at the lodge of the log house the owner made by himself. Its name was Moshiriba; the eastern end of the land in the native language. It sounded to me morisoba. I called it so during all my stay. The owner moved in here with his wife and 2 daughters 9 years ago, abandoning their urban life in Kobe. The place was populated with the various kinds of people with the same interests; love of nature. A table of the fishing result by the methods, species and gender. The owner welcomed us at the entrance with an amiable smile. He greeted us with a question as to how the fishing result was with a slight Kansai accent. We responded with a formulaic "So-so". He is in his mid- fifties, I guess, I have no sense of guesswork when it come to age. He was in a denim apron and a checked button-down underneath, wearing glasses on his round face. You can easily tell he likes his job. We brought in our things strewn over the back seat and trunk. It took us 3 journeys to and fro between the room and the car. The narrow corridor ended at our room door. Every one on the corridor could see into the room when the door was left open. No luxury was in it but such essentials as futon-mats folded, one pendant-light and some hangers on the log wall, that's it. Neither air-conditioner nor TV. For some reason, there was a rocking chair in the corner, with which I could have imagined the air of the authentic cottage life with a fire place only if I wouldn't put my eyes away from it. Anyway we could put up with any place as long as we could sleep, we had to wake up 3:30 a.m. tomorrow morning. We took a bath and waited for the dinner knock, doing some preparation for the following morning. A member of the owner's family lets us know at every event held in the inn with the door knock. Around 7:00 p.m., we were called for dinner. A Chanchan-yaki set was on the table for us. 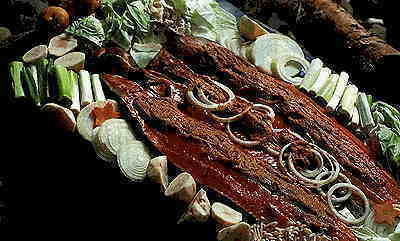 It is their specialty and every guest on his first night is treated with the delicacy: a raw slice of salmon, cut cabbages, bean spouts, and onion slices were assorted on a plate. An electric hot plate was ready to make a sizzle. Saito is a camper who likes to cook this kind of food. I decided to watch him cook instead of doing it together. I was beat. The dinning room had 5 wooden tables; one long table for a group of around ten and one for four, two for two and the one next to ours was for one. The guest w asn't yet at the table. The prepared dishes were not the same as ours, which meant he/she had stayed alone here more than 2-nights.The guest must be a fisherman/woman. No one but anglars would stay at the same place over 2 nights alone.I'm very good at guessing this. By the time we ate up chan-chan-yaki, the guest showed up. He sat on the same side of the long wooden bench. Tables are separated and the benches run the length of two tables to our corner. I nodded to him for a slight bow and gave him a second glance. To my surprise, he was the one I talked to the first day on the river. It is sometimes difficult to recognize a fisherman when he is out of his fishing attire. Beside that, I was watching his face while I tried to get him to fill me in on the river, his eyes were chasing his purple fly in the stream. I had an advantage. I identified myself about how and when I talked to him. He remembered me. Now we were on the same ballpark. His name was Igarashi. He drove all the way from Niigata. 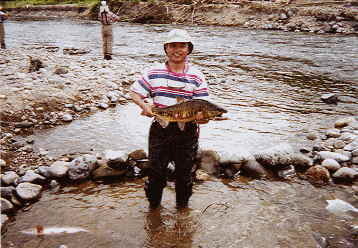 We shared some fishing stories on the common rivers in Niigata, Saito and I had been to. Once a fisherman starts talking fish, no one can stop him. We had to let out all boasts. I wasn't tired at that time. It was probably around 10:30 p.m. when we got back to our room. Saito and I did a little preparation for the following day and fell asleep instantly. An alarm blared out its piercing electric sound at 3:30. I stopped it hurriedly with the fear of disturbing the other guests. I turned on the switch of the pendant light. Saito looked so dazzled. Only one light was available in the room.There was nothing between the dazzling brightness and pitch black darkness here. 5:00 a.m. is the time to start fishing which is stipulated on the contract sheet with town authority. When all things were considered, most of the fishermen were expected to gather at the parking lot by 4:30 for the check-in and wait on the queue with anticipation for their favorite or would-be-best drop. I had one point in mind. Saito seemed to have none. I went to the public utility space to brush my teeth. There were 3 earlier risers using the place. I said "Good morning" to them and walked into the public toilet behind them because there were no use waiting for a room,doing nothing. Every thing was public there. When you are in a public place, you have to be alert. I was sitting on the toilet, someone abruptly opened the door and spotted at me, his face betrayed an embarrassment more than I did and slammed the door hastily. I calculated it might happen to anyone when I tried to lock the door which has only a makeshift lock; one brass screw with a loop head for a catch and a flimsy L-shape latch of the kind. I locked it but he pulled it off as he opened the door, it wouldn't take much power. I guessed these sort of things were daily occurrences here. I was to screw it back to the place, I found there were no hitch in the hole so I merely pushed the loop-screw back to the hole. When I got to the room, Saito was still goofing away on the futon-mat. I told him to hurry up. He retorted that we could make it without being in such a hurry. We picked up Onigiri for our breakfast prepared by the owner and headed for the parking lot. We arrived there barely before 5. Too late to get my point, I thought, but no one was standing around my place where Mr.Igarashi was on the prior day. 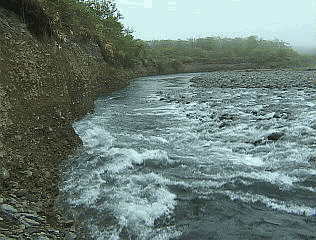 The place was on the left side downstream, bulging into the depth which makes a slow swirling stream on my left. On my right, upstream is smooth and shallow water with the same group of gentlemen as yesterday. Between them and I was a steep drop. You can smell many fish here. Salmon would stop and gather here for a while to prepare themselves for the steep stream. I found a big hidden rock which must sooth the stream downward to the bottom. I made a cast slightly downward across the stream beyond the hidden rock to reach the bottom of the point. I knew there were a lot of them. And this was the only point to aim at, not horizontally but vertically. I got a small bite on the third cast. I jerked as usual and hooked it. That one didn't run so first this time but, to play safe, I pulled it down to an easy shallow landing place. There is an unwritten rule; everyone around the fighting fisherman had to reel up their line and give way to enable him to land it easier. That is a supreme time for the fighting fisherman especially in the crowded water like here. I was the first catcher in the morning so everybody around there watched me with blessing yell and envy eyes while I was showing off my play with the fish. It wasn't a good fighter. The first one and the biggest one always stays the amongst your memories. I swam it into the pond Igarashi used theday before.